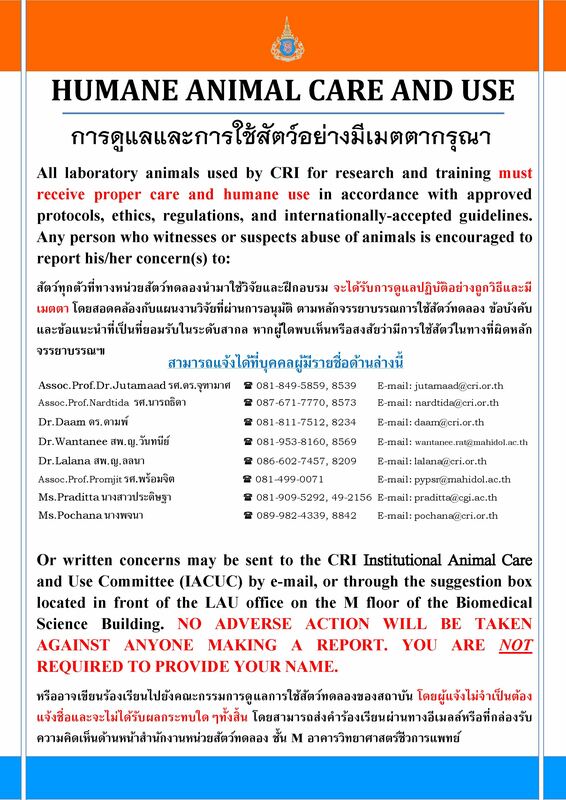 The CRI Laboratory Animal Unit (LAU) has primary responsibility for the day-to-day management of the research animal facility, as well as for implementation of CRI�s ACUP. It is headed by the LAU Chief, a qualified veterinarian with a wealth of experience in care and management of laboratory animal breeding and laboratory animal medicine, and staffed with full-time clinical veterinarians, a facility engineer, microbiologist, animal technician and animal care workers, all of whom have been appropriately trained in their areas of responsibility and who undergo continual training as necessary according to CRI policy. 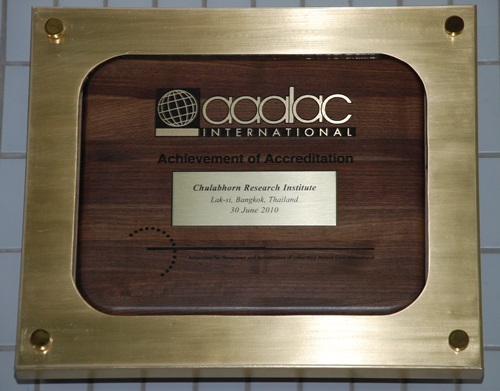 The Association for Assessment and Accreditation for Laboratory Animal Care (AAALAC) International is a private, non-profit organization that promotes the humane treatment of animals in science through voluntary accreditation and assessment programs. You can find more information here. animal use not approved by the IACUC; protocol suspensions; changes in facility size, location, or name; changes in IACUC composition or members; and other changes in the animal care and use program. CRI�s Institute Animal Care and Use Committee (IACUC) is the oversight body for monitoring and enforcing all animal care and use activities in accordance with CRI�s ACUP, policies and standard operating procedures, as well as according to the Guide for the Care and Use of Laboratory Animals and the Ethical Principles and Guidelines for the Use of Animals for Scientific Purposes. 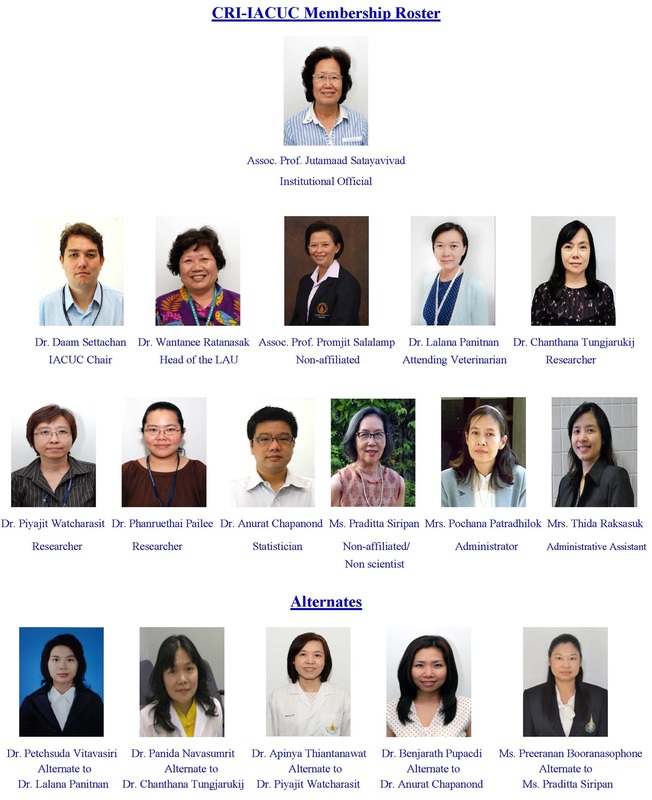 The committee comprises CRI animal researchers, non-laboratory animal researchers, non-scientists, non-affiliated scientists, and non-affiliated non-scientists. The IACUC also conducts annual ACUP reviews and animal facility inspections, as well as reviews all CRI animal use protocols and makes recommendations for their approval to the Institutional Official (IO) prior to work on any project dealing with laboratory animals being carried out in the facility.